There are years that ask questions, and years that answer. Zora Neale Hurston’s unforgettable line from Their Eyes Were Watching God inspired many honorees Oct. 21 at the 15th annual Zora Neale Hurston/Richard Wright Foundation Legacy Awards ceremony. Named after two of the most beloved American writers — documentarians of the black American experience — the ceremony honored those following in the footsteps of Hurston and Wright. The ceremony was a beautiful black experience, and brought to mind one of Master P’s interludes on Solange Knowles’ new album: If you don’t understand my record, you don’t understand me, so this is not for you. This was a space for black writers and poets to gather, to celebrate each other and be celebrated. Ernest J. Gaines was awarded the North Star Award, which “pays homage to the significance of the North Star for enslaved Africans, who looked to it as a guide to freedom.” Gaines’ works of course include A Lesson Before Dying, The Autobiography of Miss Jane Pittman and A Gathering of Old Men. He was there to accept in person. 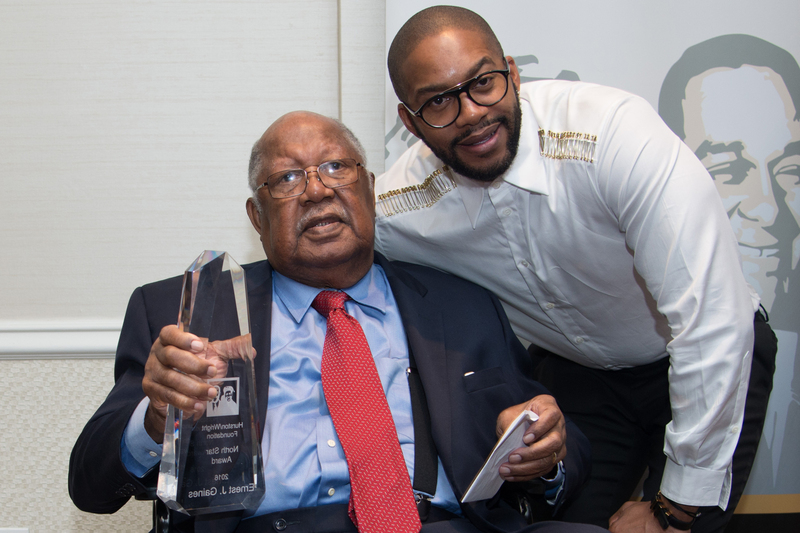 Ernest Gaines holds his North Star Award while posing for a photo with Mitchell Jackson. What was really nice about this ceremony was their dedication to lifting up younger writers, and those at the cusp of their writing careers. While debut fiction is set apart from fiction, undergraduate and graduate writers are in a league of their own. The Debut Fiction Award went to Sanderia Faye for her novel Mourner’s Bench. The other nominees were Naomi Jackson for The Star Side of Bird Hill and Chigozie Obioma for The Fishermen. The Fiction Award went to James Hannaham for Delicious Foods. Angela Flournoy for The Turner House and Caryl Phillips for The Lost Child were finalists for the award. The Nonfiction Award went to Pamela Newkirk for Spectacle: The Astonishing Life of Ota Benga. Elizabeth Alexander for The Light of the World and Gerald Horne for Confronting Black Jacobins: The United States, The Haitian Revolution and the Origins of the Dominican Republic were honored as finalists.